Up. I hope. League 2 got underway yesterday and NHT tied nilnil with Stanley. I searched for a feed for the game but there was nothing doing other then a few new viruses on my computer now. There were some live chat things going on so I could keep up with the game. Of course stats and recaps tell the story as well. I was really happy to hear about the return of Adebayo Akinfenwa. He was with the team when I started following (or discovering, I should say) them back a couple years ago. He's a good striker. And a consistent one. One crazy thing I found in his goal scoring history is that it looks like he scored 11 goals in his first 22 games. Granted... he started with Barry Town in 2002 but his 7 goals in 8 games his first year turned some heads for sure. One thing I've learnt about the English soccer tier is that when you have some above average talent as a young player things can get all wonky like. The next year (2003-04) he started with Barry but Boston Utd picked him up early only for a short stint though because that same year Leyton Orient came calling. That didn't last long either. No goals, no starts. Finally, his last team that year was Doncaster where he promptly scored 4 goals in 9 apps. When the 2004-05 season came he moved up the English soccer ladder. Torquay United. 14 goals, 37 appearances. He just about maintained his scoring efficiency even at a higher level and with more games (.38 goals p/GM with Torquay, .42 for his first two professional years. In 2004 Swansea latched on to him and he stayed put there for two years. Even better competition here. His goals scoring rated dropped down to .24 p/GM. Swansea, in turn dropped him. Millwall picked him up. No goals here in 7 games in 2007. Perhaps his career was thought to be on the down swing. Not so fast though. That same year is where we get to Northampton Town and he regained form. 7 goals in 15 games. He ended up staying there for 3 years with an outstanding goal scoring record. 37 goals in 88 games (.42). Back to where he was when he was with Barry, Boston Utd, Leyton and Doncaster in his first 2 years. Again, with heads turned, 2010 saw him move back up to Gillingham where they played him just about every game. His efficiency went back down though. 11 goals in 44 (.25). So back to NHT he came. 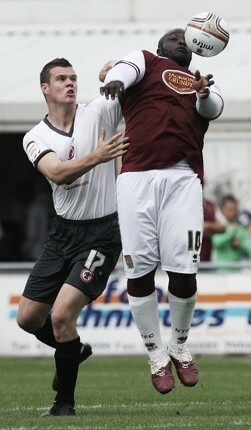 I heard the crowd at Sixfields was very happy to see him back. With that goal rate of just about a goal every other game? I am too. Long post here to spend on one guy, but it is pretty impressive what he has done in 8 years. All the moves, all the goals. Overall: 87 goals in 259 appearances (0.34). For comparison, that is a Fredy Montero like rate here in the MLS (.35) and even close to a Brek Shea (.40). 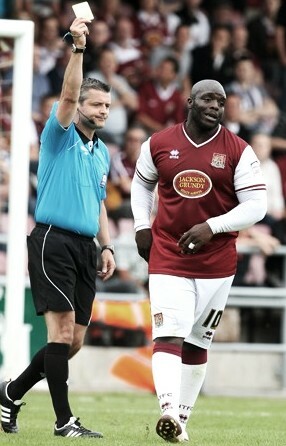 Another reason I spent some time with Akinfenwa? He doesn't quite look like any striker I've ever seen. tweet from SI man Grant Wahl "Based on ppg MLS playoffs today would be: Automatic bids West (LA, DAL, RSL) East (PHI, CLB, KC). Wildcards: SEA, COL, DC, CHV. (NY out.)" ppg. now we are talkin' the right language! DC sneaking in there. 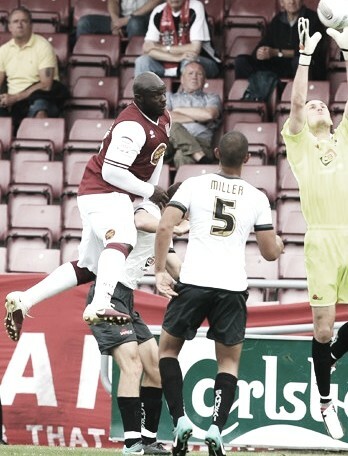 man, Akinfenwa is man of similar stock, i must say. i can relate. not the scoring goals part, but the team thick part.